Esplanade – Theatres on the Bay (also known as the Esplanade Theatres or simply The Esplanade) is a performing arts centre located in Downtown Core near the mouth of the Singapore River. Named after the nearby Esplanade Park, it consists of a concert hall which seats about 1,600 and a theatre with a capacity of about 2,000 for the performing arts. Aerial panorama of Singapore's Downtown Core. The Esplanade Theatre sits to the right of the panorama. In 1989, the Advisory Council on Culture and the Arts, chaired by Deputy Prime Minister Ong Teng Cheong, produced a report assessing the status of arts in Singapore. The report would form the blueprint for cultural policy in Singapore, and led to the establishment of the National Arts Council and National Heritage Board. The report noted a lack of suitable performance arts venues; for example, Victoria Theatre was deemed only suitable for small to medium-sized performances, while Victoria Concert Hall was similarly lacking in its seating capacity and stage size. It recommended that a new performing arts centre be built, and in 1992 the Singapore Arts Centre (now known as "Esplanade Co Ltd") was established to build the Esplanade. Planning for the construction of the centre started in 1992, headed by the Singapore Arts Centre Co. Construction officially started on 11 August 1996, with a groundbreaking ceremony officiated by then Deputy Prime Minister Dr. Tony Tan. The Esplanade occupies the site of the former "Satay Club", a popular food haunt for Singaporeans which had been discontinued prior to the Esplanade's construction. The "Satay Club" had been relocated next to Sembawang Shopping Centre, before closing down. The Esplanade was developed at a cost of about SGD 600 million. Completed in February 2001, the centre was officially opened on 12 October 2002, by the then President of Singapore S. R. Nathan. On 5 July 2005, the opening ceremony of the 117th IOC Session was staged in the Esplanade, featuring a 30-minute-long performance aimed at showcasing Singapore's multi-cultural heritage to her international audience. For its last financial year ending March 2014, the Esplanade incurred a loss of S$2.3 million, the first operating deficit since its opening. This loss was despite the Esplanade racking up relatively similar numbers in terms of audience attendance and activities from the previous year and was attributed primarily to the drop in sponsorship and donations. Esplanade MRT station opened on 17 April 2010 providing a connection to the island's train system. Aluminium sunshades ornament the roof of the Esplanade. The original design, presented to the public in 1994, consisted of unadorned glass cases over the theatres, and initially elicited criticisms from the public, including calling it "two copulating aardvarks". Critics also accused that the design is insensitive to Singapore's location and climate as it would have created a greenhouse in the tropical climate of Singapore, but according to DPA director Vikas Gore some form of shading was always intended, and a cladding of aluminium sunshades was added to the final design. The unique architectural design has been said to have an appearance similar to either a durian (a tropical fruit) or the eyes of a fly. Hence, the building is colloquially known to locals as "the big durians".. More than 7,000 triangular aluminium sunshades that cover its two circular glass shell structures looked somewhat like spikes on two halves of the fruit. The structure wasn’t meant to be a durian; it ended up being like that because it seemed to the architects the most interesting way of doing sunshades. They wanted to use glass because the views from Esplanade are beautiful in all directions, but since Singapore is so close to the equator, the structure also had to be protected from the sunshine and heat radiation. Other than performing venues, the Esplanade also contains meeting venues, as well as other lifestyle and arts related services. The concert hall and theatre are connected to the main concourse via a foyer, while the Esplanade Mall is accessible through an entry point located between these 2 halls. The concert hall serves as a venue for concerts, recitals, and other performances. There are only five other halls in the world with such state-of-the-art acoustics. The orchestral platform is able to hold up to 120 musicians. The concert hall's pipe organ comprises 4740 pipes and 61 stops. It was designed and built by Johannes Klais Orgelbau. The Concert Hall is able to seat about 1,600 people over four levels. Types of seats include Stalls, Foyer stalls, and Circles 1, 2, and 3. There are another 200 seats in the choir stalls behind the concert hall stage, which may be converted into Gallery seats for an additional 200 people. The Lyric Theatre which has a capacity of about 2,000 seats is a type of an adaptation of the horseshoe form of a traditional European opera house. The fan-shaped Recital Studio is able to contain 245 people and is a venue for small scale chamber musical performances, as well as presentations and meetings. The Theatre Studio, with a capacity of up to 220, is a small setting for experimental theatre and dance presentations. The library@esplanade, located on the third floor, is Singapore's first public library devoted to the performing arts. There are also outdoor performing centres, and retail and food space at the Esplanade Mall. There is an outdoor open space on the fourth floor of the building, which is the highest point open to the public. Esplanade's programmes are broadly organised around key areas – the community and access programmes form the foundation of activities at the centre, collaborations with mainly local arts groups help develop the industry, while leading international productions aim to offer innovative programmes in the major arts genres. These programmes are presented in different festivals and series designed to appeal to a broad range of audiences. Esplanade's in-house programming team presents over 14 festivals and 20 on-going series throughout the year. In the relatively short time that The Esplanade has been open it has played host to acts and performances, including the Queen musical We Will Rock You, Avenue Q and the defunct Mosaic Music Festival. It has also championed locally based acts. Wikimedia Commons has media related to Esplanade - Theatres on the Bay. ^ Lily Kong; Ching Chia-ho; Chou Tsu-Lung. Arts, Culture and the Making of Global Cities: Creating New Urban Landscapes in Asia. Edward Elgar Publishing. pp. 89–90. ISBN 9781784715847. ^ "Design for world-class arts centre unveiled". NewspaperSG (Originally from The Straits Times). 22 July 1994. Retrieved 15 April 2015. 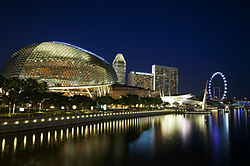 ^ "Esplanade Theatres on the bay Singapore - So Much to Choose From!". SG Travel. 1 May 2013. Retrieved 15 April 2015. ^ a b c MobileReference (1 January 2007). Travel Singapore: Illustrated Travel Guide, Phrasebook, and Maps. MobileReference. p. 94. ISBN 978-1-60501-015-1. Retrieved 28 November 2013. ^ "T.Y. Lin International Group | Projects | The Esplanade – Theatres on the Bay". T.Y.Lin. ^ "Satay Club". Infopedia. Archived from the original on 3 December 2013. Retrieved 28 November 2013. ^ "It's showtime at the Esplanade". NewspaperSG (Originally from The Straits Times). 13 October 2002. Retrieved 15 April 2015. ^ Martin, Mayo (12 November 2014). "Esplanade posts losses for first time". MediaCorp. TODAY. Retrieved 12 November 2014. ^ DP Architects : The Master Architect Series. ^ "Interview Vikas Gore: Esplanade Integrates Modern and Asian Elements". ABC Interview with Vikas Gore. Archived from the original on 26 October 2009. ^ The New York Times "Travel Guide: Singapore"
^ "#mydurian. Yours Too". Retrieved 9 October 2017. ^ "Concert Hall introduction in Esplanade homepage". Archived from the original on 12 November 2006. Retrieved 18 February 2007.